at the October fest event in the Olympic 32 Rink. 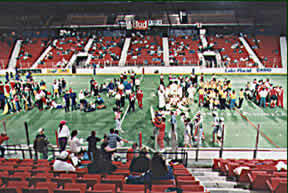 Hartford Hellions of the MISL. 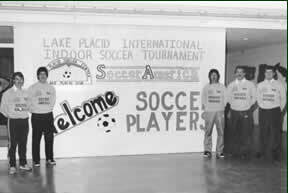 1983.– “First Annual Lake Placid International Indoor Soccer Tournament” debuts with two divisions – the Men’s and Women’s Open. 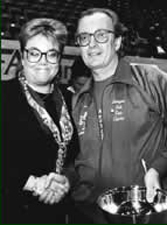 In the Men’s final the Cape May Celtics from N.J. down the British All-Stars whilst the Women’s tourney is won by the Boltra Bolts from Massachusetts. Director Larry McFaddin hands over the silverware to the winners of the inaugural tournament – The Cape May Celtics. 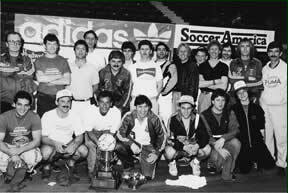 The profile of the indoor tournament was raised with help from our friends at America’s number one soccer publication – Soccer America. Here is the April 12th cover from that year. 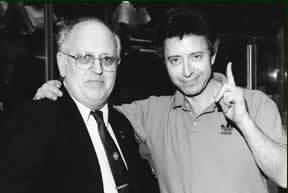 In the first 8 years of the tournament the British All-Stars were a mainstay of the play-off scene. 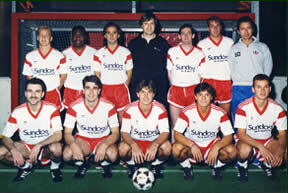 The team was an assortment of NCAA college players of British Nationality, who were currently studying in the USA. Many who went on to play pro ball. 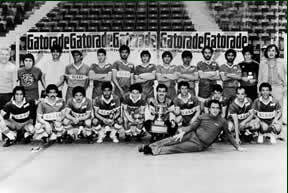 1985.- A Thanksgiving Youth Soccer Tournament was trailed at the Olympic Arena. Nike Soccer. 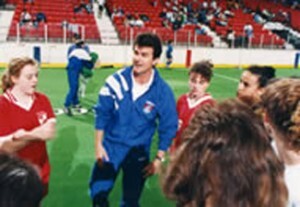 USA Women’s team star – Kris Lilly plays in the tournament. 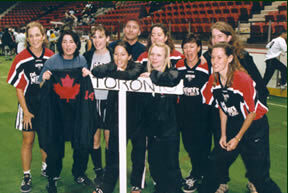 The organizing committee poses in front of the welcome banner at the second tournament. 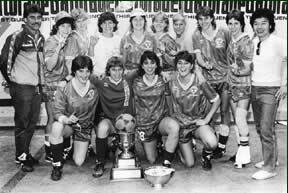 Hank Leung’s George Mason were a National Powerhouse in NCAA soccer and took the Women’s title. 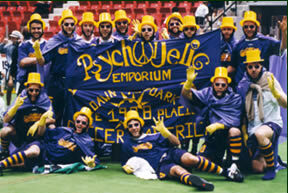 1988.- LPSC purchases a second carpet, and runs concurrent matches in the 1980 and the 1932 rink.The Men’s Over30 section debuts at the Indoor tournament. Almost Home! – Dom Mescia of Riccardi’s celebrates his goal in the final versus Rochester United. 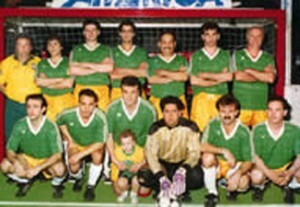 1989.- The Indoor tournament has risen to 52 teams. A Multi-media video introduced to Saturday evening bash to rave reviews-and becomes a tournament mainstay. 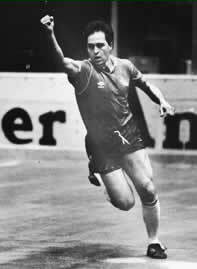 Men’s over 30 tournament MVP Pat Ercoli, a former MVP of the MISL with Baltimore Blast, celebrates his 13th goal of the tournament. 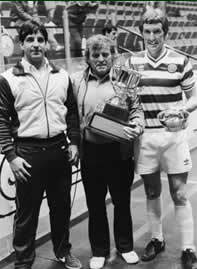 Pat is now General Manager of the MSL-bound Rochester Rhinos. 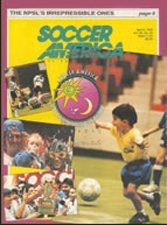 1992.- Soccer America sponsor the Indoor Tournament creating the distinctive quarter moon and soccer ball insignia and adding to the name the popular “Dawn to Dark” festival, which captures the fact that soccer action goes from early morning to late at night. 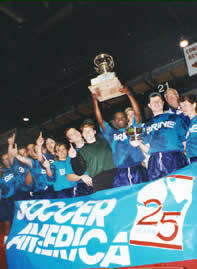 Coach Felix Lapine accepts the Men’s Open trophy from Publisher of Soccer America – Lynn Berling-Manuel. 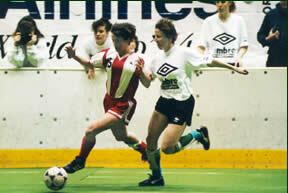 Women’s Open – Soccer Store, NJ / Coed Division – Placid Rangers, NY. Club Fit from Mahopec, Long Island took the first Over-40 section of the Dawn-to-Dark. 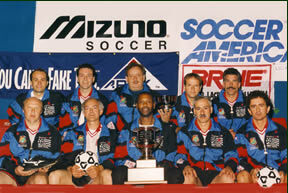 1998.- Brine/Hilfiger sponsor the D2D tourney. The Psychedelic Emporium took the parade prize this year! The tournament is dedicated to Bobby Preston, a local sportsman who tragically died this year.